1. This Promotion is valid from 7 May to 31 Dec 2018 (both dates inclusive) (the “Promotional Period”). 2. To enjoy the Promotion, Cardmember has to make purchase/purchases via www.shopback.sg/dbs-promo between the Promotional Period to be eligible for the Cashback. 3. 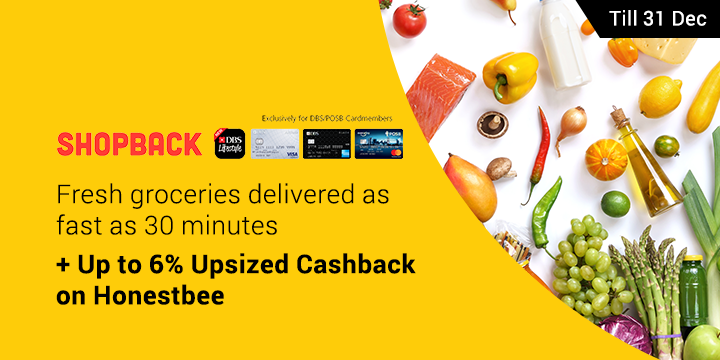 The existing ShopBack customers’ offer is valid for multiple redemptions, Cardmembers will receive an additional 2% Cashback with any spend on Honestbee during the Promotional Period. 4. Cashback is valid on top of existing discounts and promo codes offered by selected Merchant. 5. Cardmembers must enable their cookies to allow their Cashback to be tracked. 6. For Cashback crediting, please refer to ShopBack's terms and conditions which can be found at http://support.shopback.sg/hc/en-us. 7. Payment must be made using a DBS/POSB Credit or Debit Card. 8. For further details on how ShopBack's Cashback and cashout options work, please refer to ShopBack's terms and conditions which can be found at http://support.shopback.sg/hc/en-us. 9. Orders that are exchanged, cancelled or refunded will not qualify for the Promotion. ShopBack's terms and conditions apply. 10. DBS/POSB is not the supplier of and accepts no liability for the goods and services provided by ShopBack involved in this Promotion. 11. ShopBack and DBS/POSB reserve the right to vary any of these terms and conditions, or to withdraw this Promotion, at any time in their discretion without prior notice. 12. All information is accurate as at time of publishing or posting online.